Updos for Short Hair: Kristen Stewart’s hair is short and sassy, with this auburn choppy and messy ‘do. 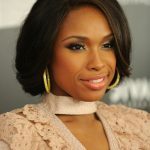 The hair is given plenty of layers, with shorter lengths at the top with longer layers in the bangs to frame the face. With the hair parted at the center the hair is given a generous amount of a heat protectant spray and roughly blow dried. The hair is then given a spritz with a volumizing sea salt spray, and left to dry naturally, giving that beachy wave. This hairstyle is perfect for wispy flicks, and can be achieved by using a round brush, while blow drying, curling outwards. Then spray the hair with hairspray, to hold into place. 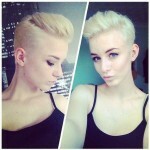 Under: Popular Hairstyles Platinum undercut with pompadour – make a bold statement!